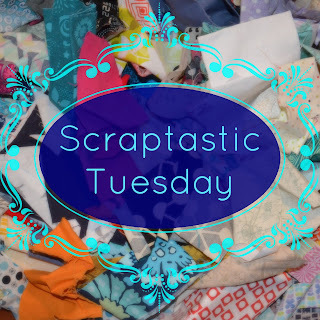 Scraptastic Tuesday - what is a scrap quilt? 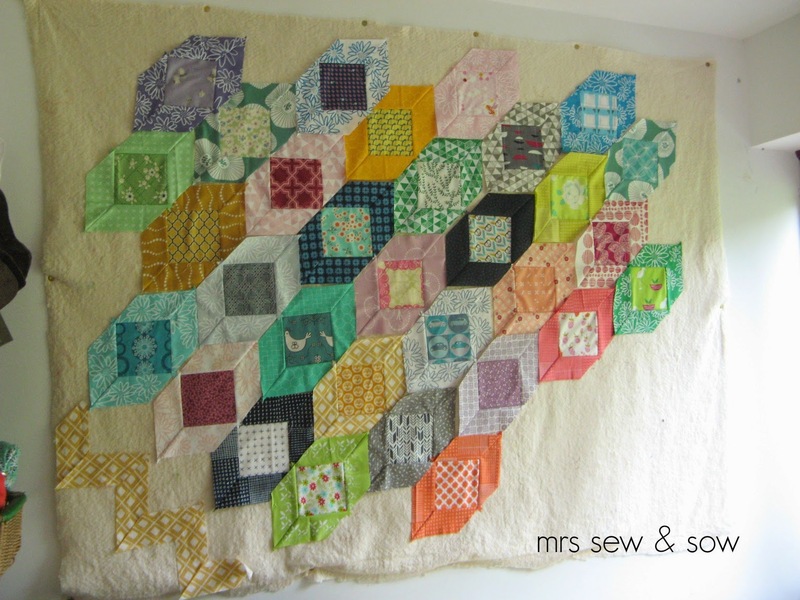 What is a scrap quilt? 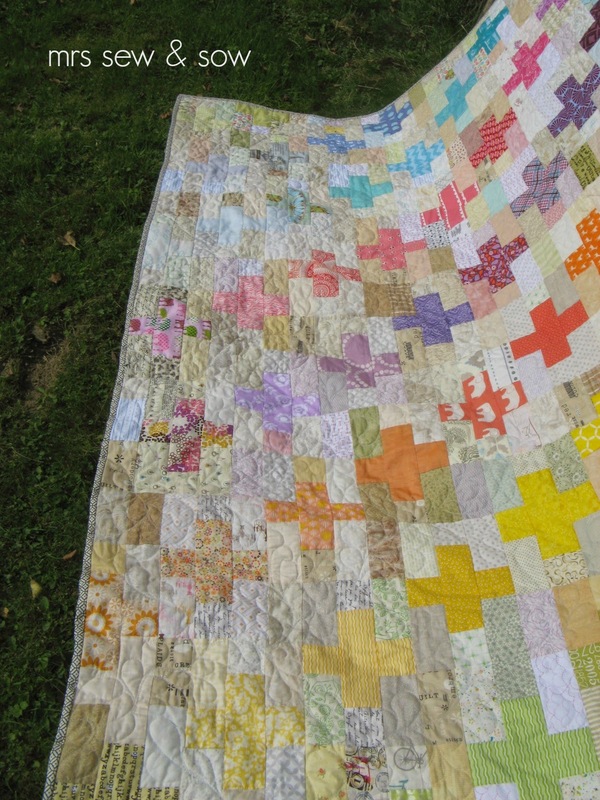 The simplest answer is any quilt that uses up whatever we call scraps! You had my definition of scraps last week! Hmmm!? Does it all have to be scraps? Can we add in some background, sashing fabric from stash? I'd have to say yes! 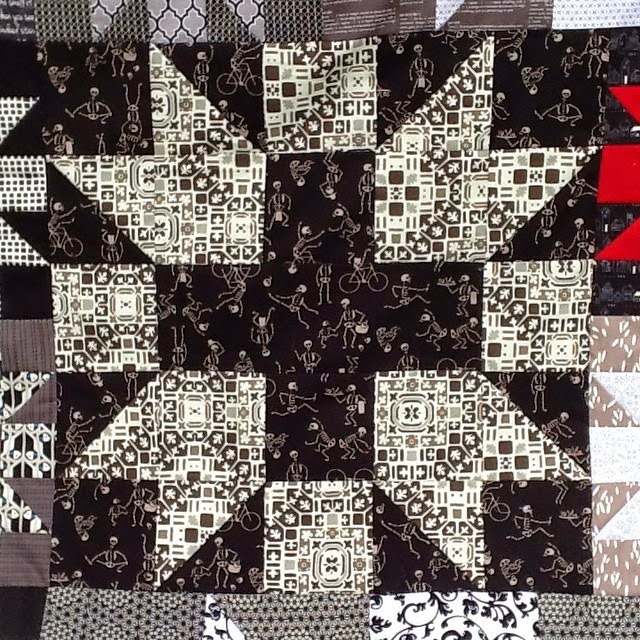 I added the black background fabric to my scraps for this scrappy project - a pattern called Kaleidoscope Hexagon by Carolyn Forster. The black pulls it all together. 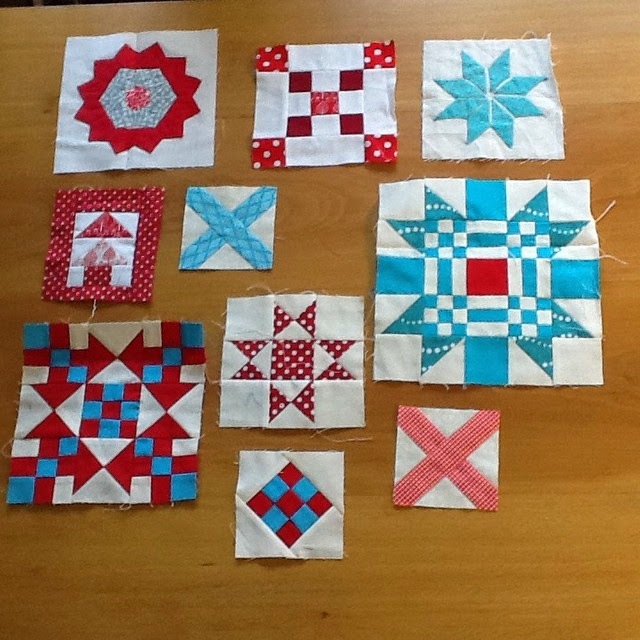 And these quilts in turn provided the tumblers for my new project with the Dresdens! 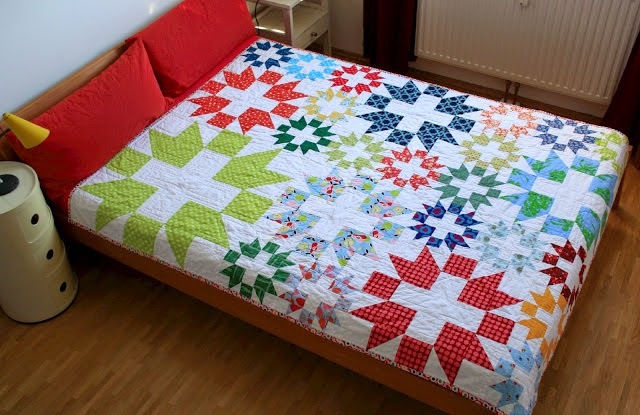 Does it still count as a scrappy quilt? How many different fabrics should it contain before we can call it scrappy? As many as possible I'd say! 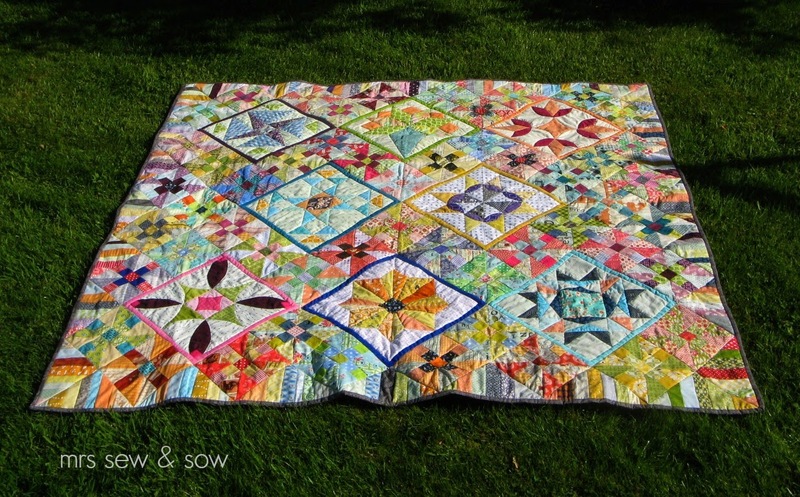 These two quilts really have a scrappy feel due to the amount of different fabrics in them though some were pulled from stash and some from my scrap bins. The setting triangles in the one just above did all come straight out of my string collection. I love colour and love to include different colours or shades of those colours in my chosen palette. 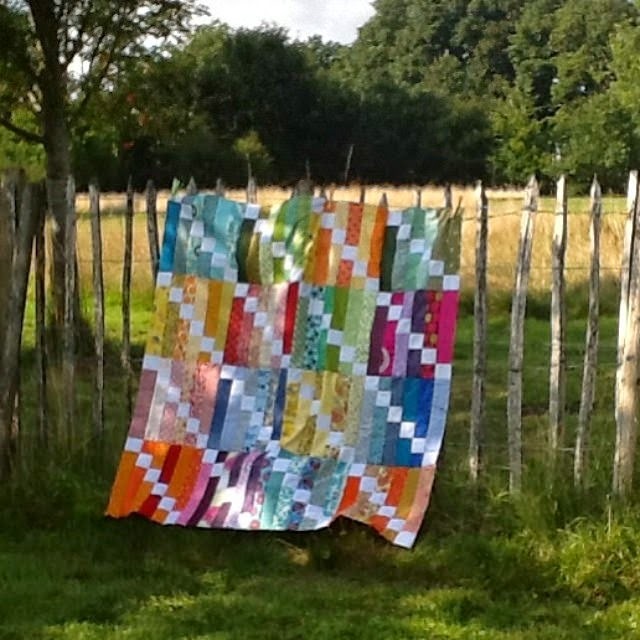 It is something I've learnt from putting quilts together that if one colour looks out of place then the answer might be to put more of that colour in rather than taking it out. 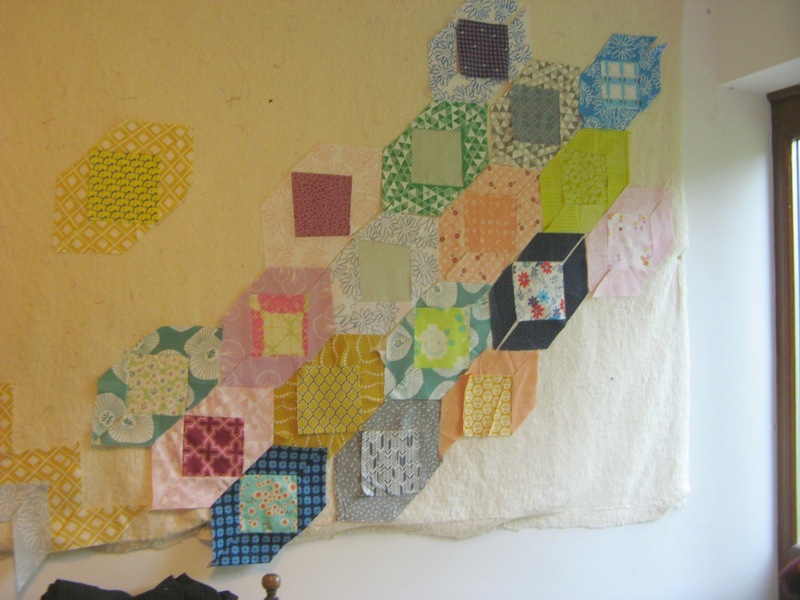 This can be especially true of bee quilts if your background comes from different sources. I would have been delighted to make something scrappy today but have spent the day coughing and sneezing, watching TV from the sofa. Hopefully I'll feel better next week. Be sure to visit Leanne to see what she has been up to! In the meantime Happy Scrapping! I saw Claudia's fabulous pattern, Star Plus, a while ago on IG and she was asking for testers - I loved the pattern so much I put my hand up! Claudia kindly allowed me an advance copy of the pattern to test and I thought it would make a gorgeous boy quilt with it's graphic look. 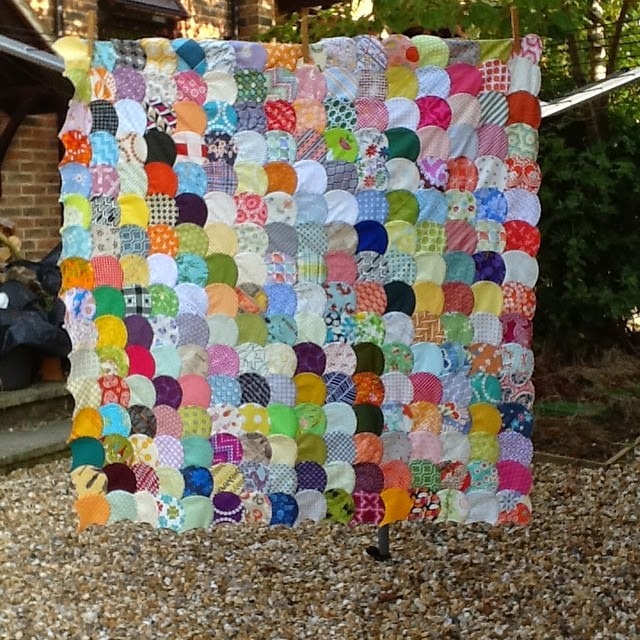 I haven't made a quilt just for my son in a long time though he has adopted several and particularly took to the colour scheme of this one! 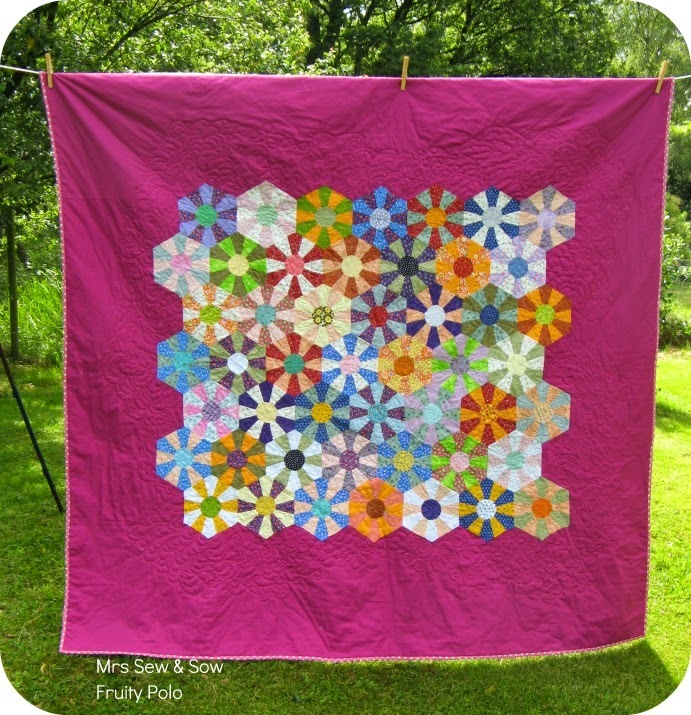 So when I asked which colours to make his star plus quilt he wanted the same colours! 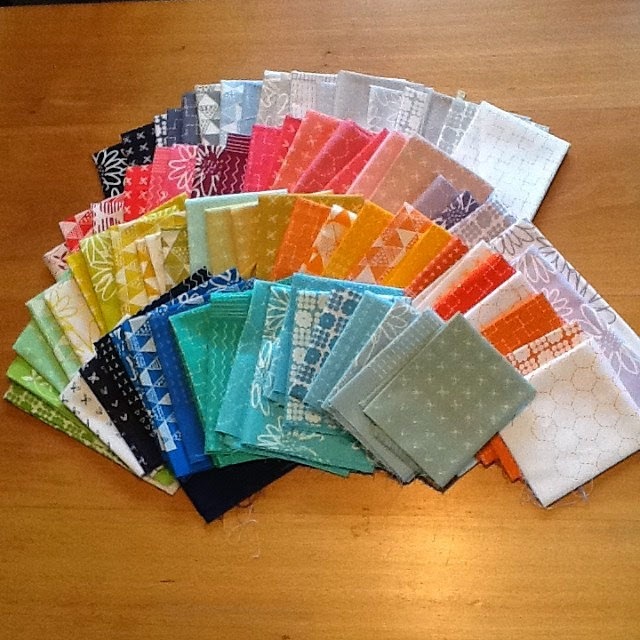 In fact I have included some of the same fabrics! And I have enjoyed everything about it - well perhaps I would be happy to miss out on the HST trimming. 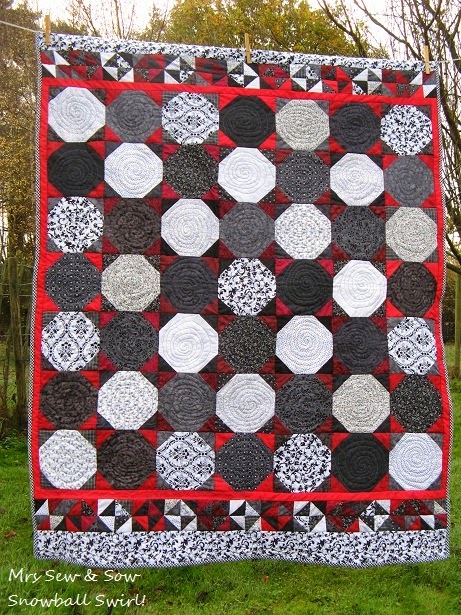 I love the very graphic block, the different sizes of the blocks and to my surprise I have enjoyed searching through my black, grey and white fabrics. I was particularly pleased to find a good home for these happy skeletons dancing around the background in this star! My son has a sense of humour! And of course I loved adding that injection of dark red. Just enough I hope! 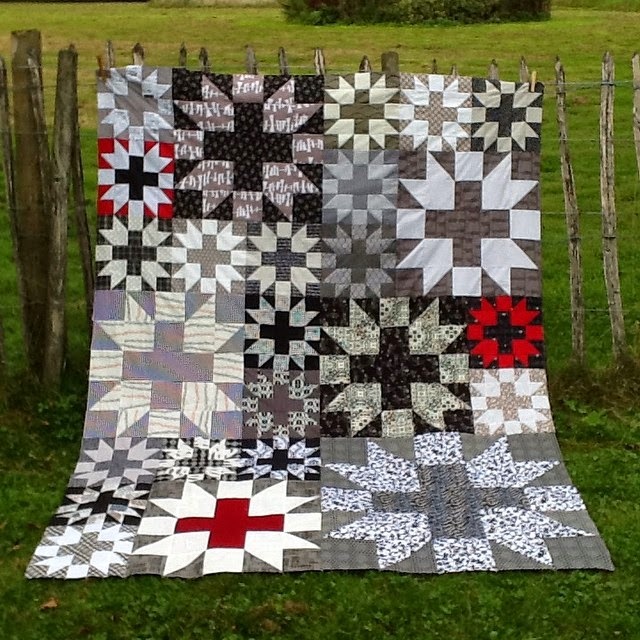 Now I'm just waiting for the backing fabric to arrive and then I can finish this quilt off for his Christmas. This will be on my next FAL list for sure. 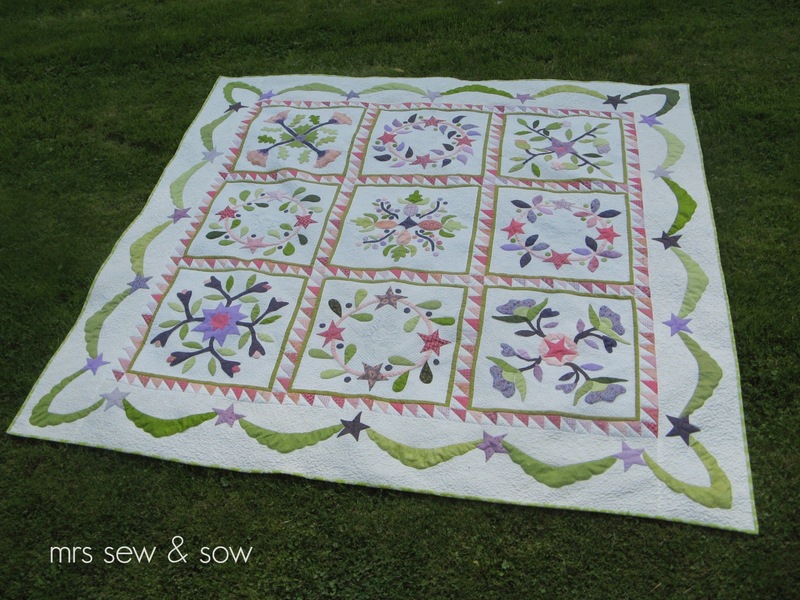 As you can see my quilt is quite different from Claudia's quilt and I can imagine some other beauties with this very versatile pattern. 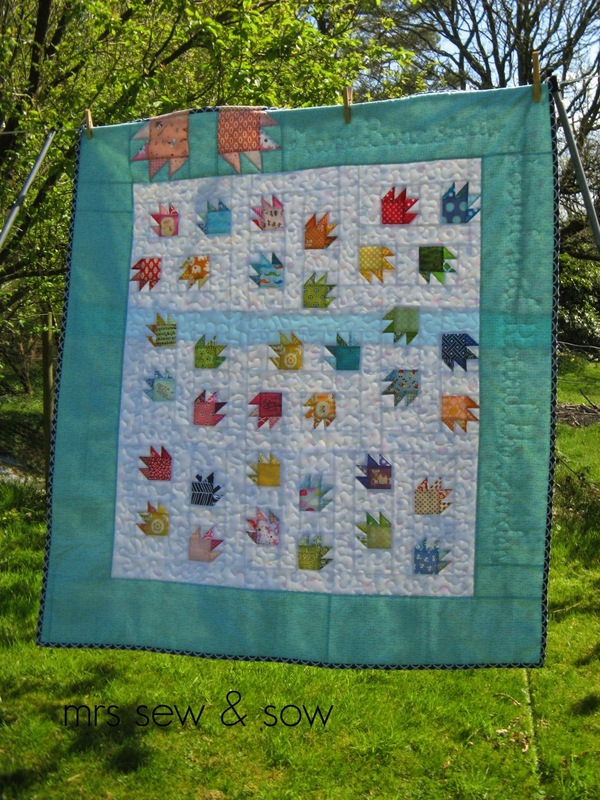 I can thoroughly recommend it and will probably make another more colourful version sometime ....thank you Claudia and wishing you every success in launching your pattern. This is Claudia's second version in linen and red! 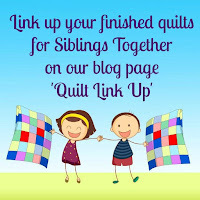 Leanne who quilts at She Can Quilt and I are both on a mission ! 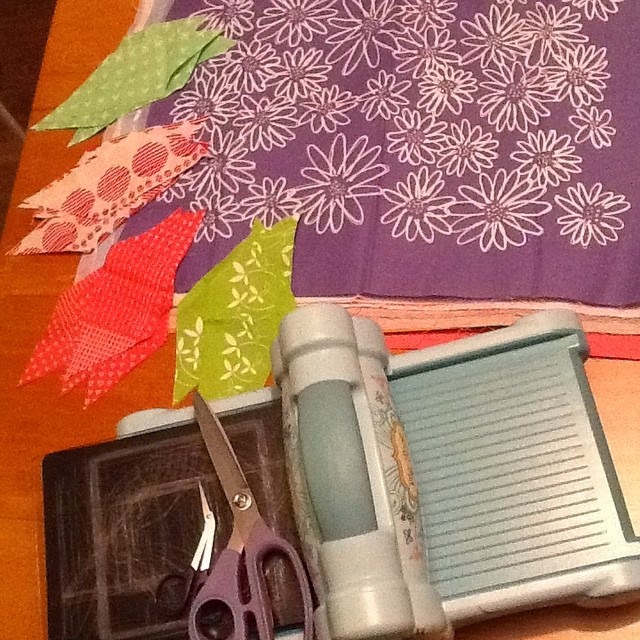 We want to reduce the amount of scraps we have and invite you to play along! We are going to be working on scrappy projects and will show you our progress on Tuesdays. 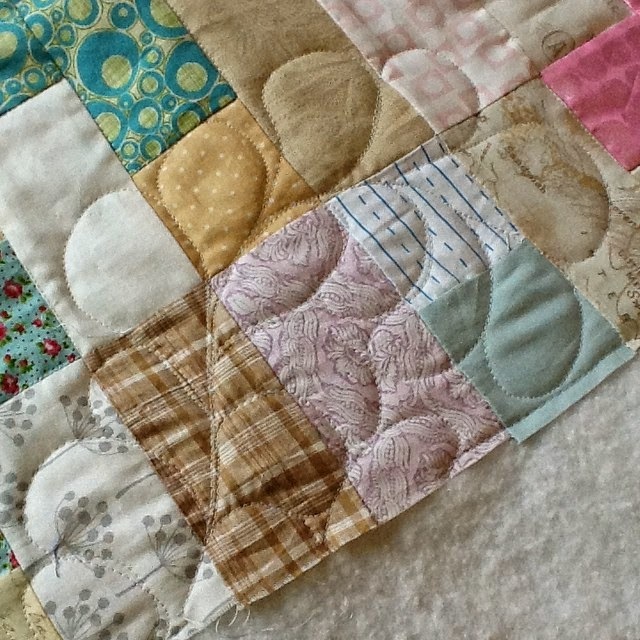 You are welcome to link up with us on the Second Tuesday of the month with your own scrappy projects - don't worry they don't need to be finished. Leanne is working on a button (as I am a techy numpty) and she is hoping to find some prizes to share. 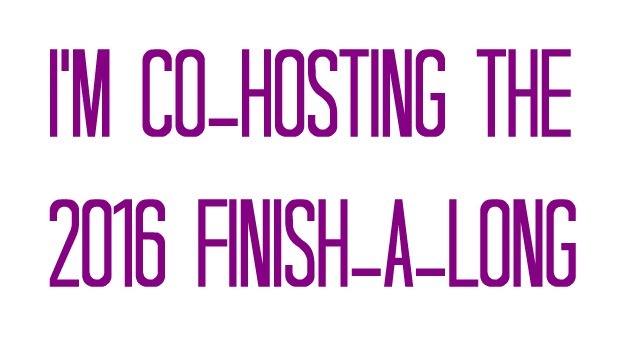 So please encourage us with your enthusiasm, your own projects and any scrappy information or links you care to share! 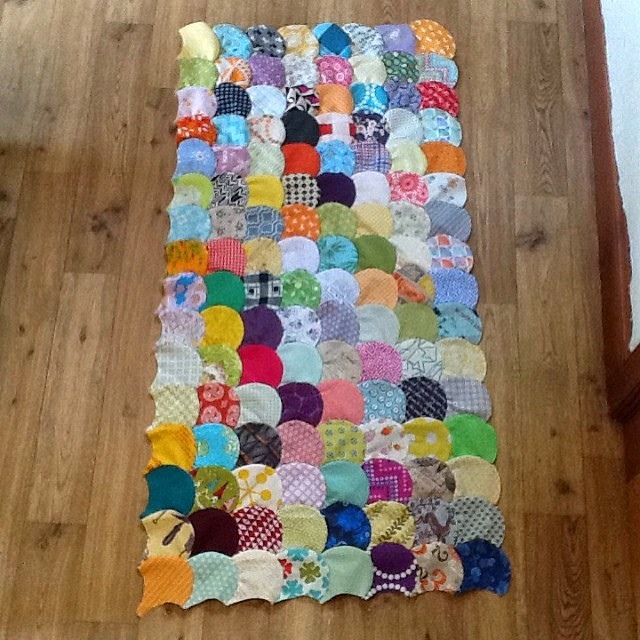 Charm squares and other pre-cuts - I now cut charm squares from any fabric I buy to encourage me to use it! As you can see I am a bit of a magpie but having paid lots of money for this fabric I am most reluctant to throw it away. Even the small bits. As you can see I am well on my way but sadly it seems to have made little difference to my huge piles of scraps! I started off making those border blocks - it was going to be a whole quilt. Then I decided to make Dresdens from some tumbler shapes I had cut to excess for another project and thought they went well together. I was going to use a sheet as the background for my Dresdens but thought it wasn't scrappy enough. I raided my LV scrap bin and cut and stitched over 500 2.5" to make my background. 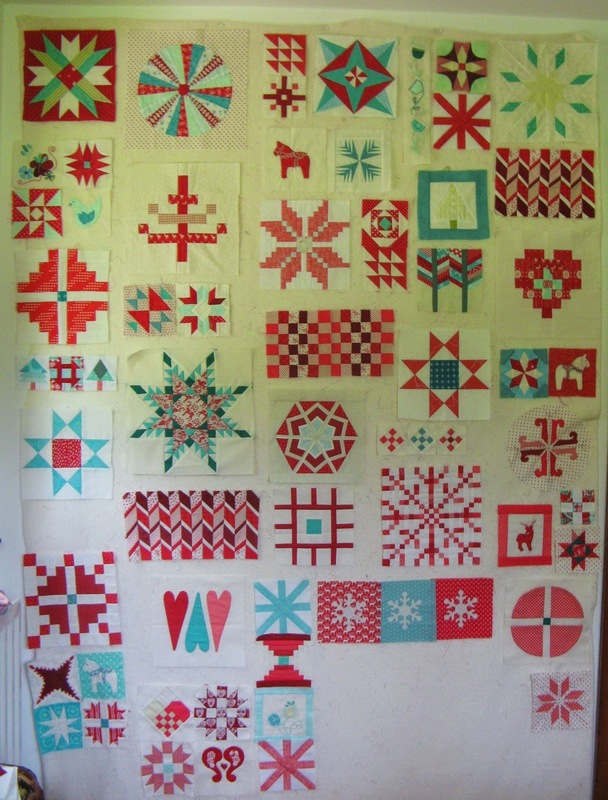 My next task will be to applique those Dresdens down but I am trying to decide if they look ok as they are or whether they need a skinny border like the one third row far left to make them stand out! Why not let me know what you consider a scrap! And let me know what scrappy project you are working on or plan to! Do visit Leanne too as I'm sure she has something scraptastic to show you! 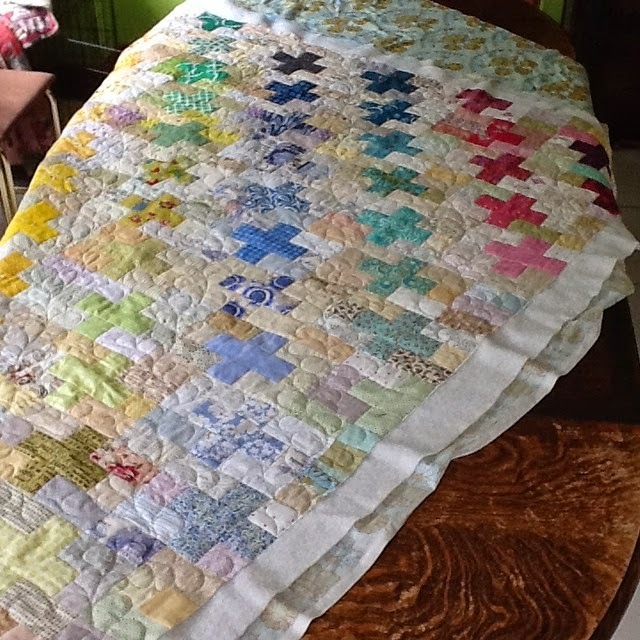 This beauty has been waiting for over a year to be quilted. 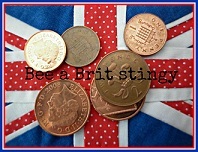 It is shocking as my fabulous bee mates in Bee a Brit Stingy helped to make this and I have been a real slow poke in getting on with it. I said I would embroider details on all the siggy blocks - that is now done - with help from the lovely Lucy who did her own! Pretty pleased with this though! 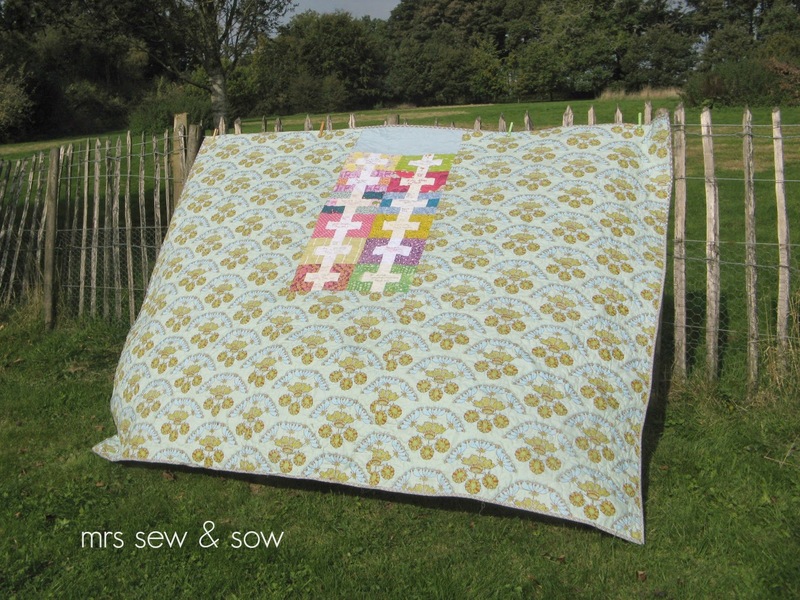 I had thought of piecing reverse blocks for the back - gave up on that idea! And now I can enjoy it ...because it is all done! And now I only have four UFOs left! Just as well I have started lots of new things isn't it...? 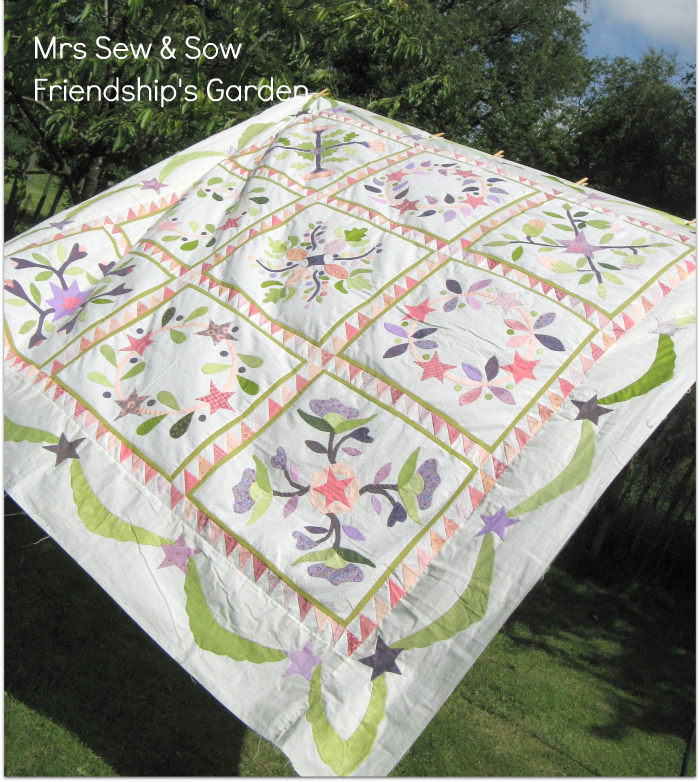 Friendship's Garden was my oldest UFO dating from 2005 when I went on a course to learn how to applique. It was a great pattern to choose as there are straight lines, inner and outer curves but it is not so complicated to put you off. It is a Blackbird Design by Alma Allen and Cherie Ralston. 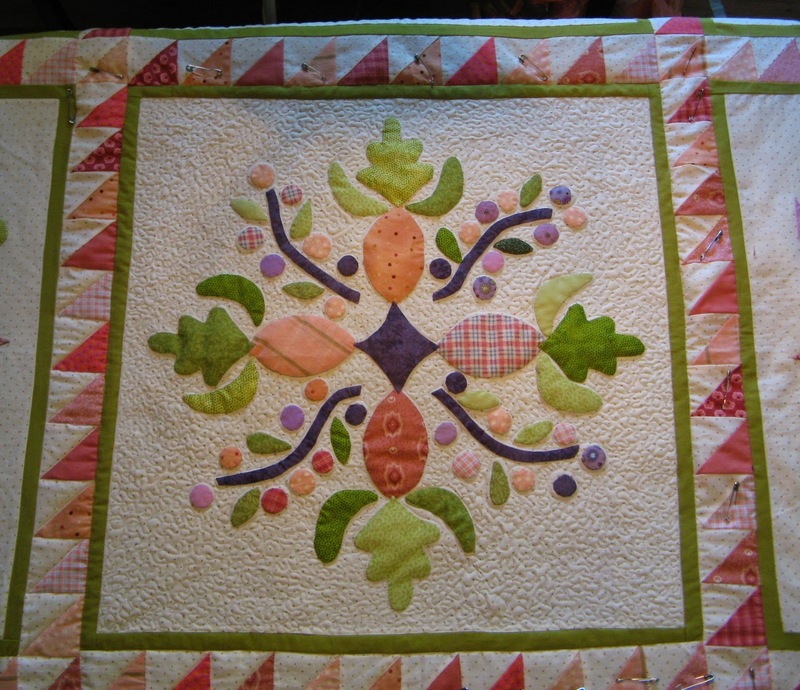 This is the original from the book - I moved the pineapple block into the middle so I could turn my quilt around anyway up and made a block from a different Blackbird design as my ninth block. 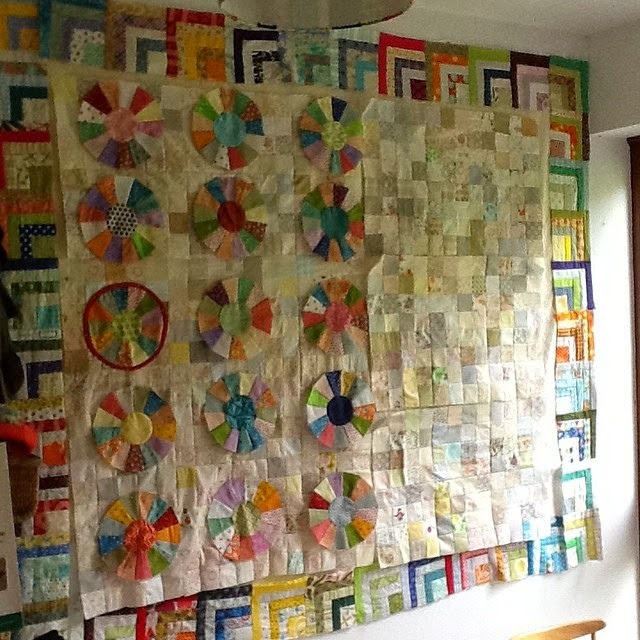 I had a very patient teacher in Julia Illman - she still teaches and has her own shop called the Patchwork Cabin in Great Bookham in Surrey. Perhaps I should send her a photo of my much belated finish? And then when I finished that it was that swag border that made me delay further. 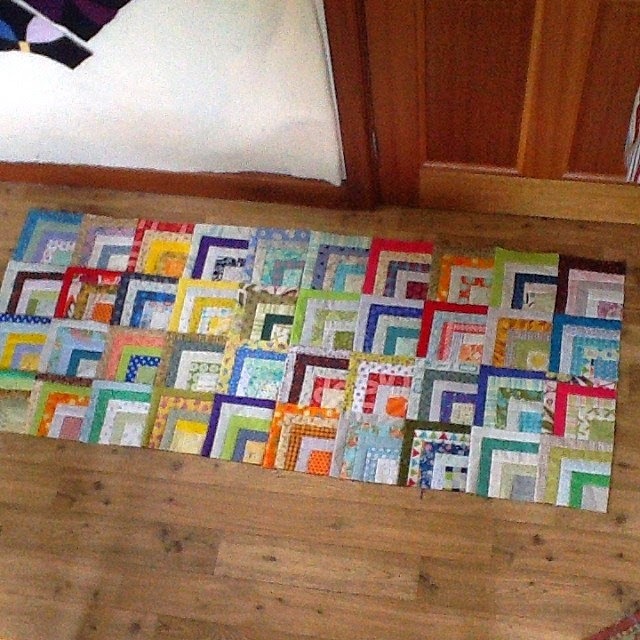 And then the block to getting it finished was how to quilt it. I have talked it over with Helen so many times but then we talked about stippling (again - I'm sure). The stippling was the right decision without a doubt - thank you Helen - but it nearly drove me to tears! 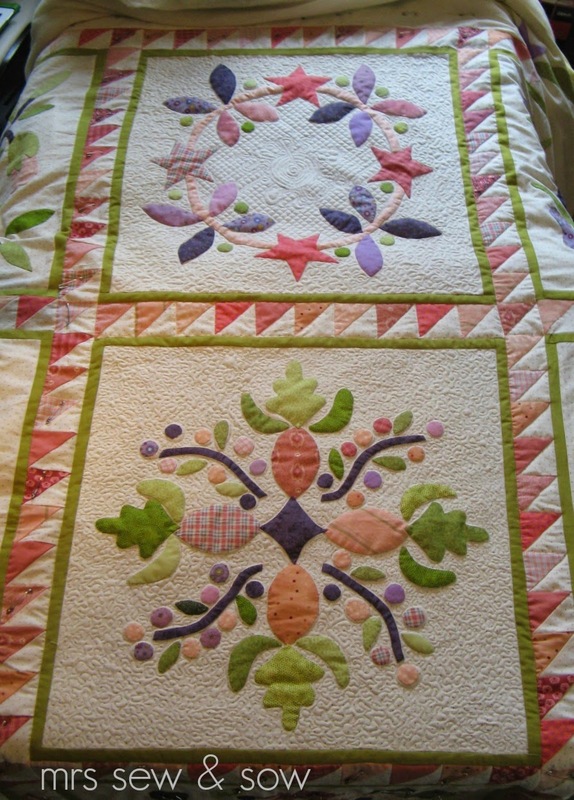 So very boring but just what was needed to make the applique on this quilt pop. 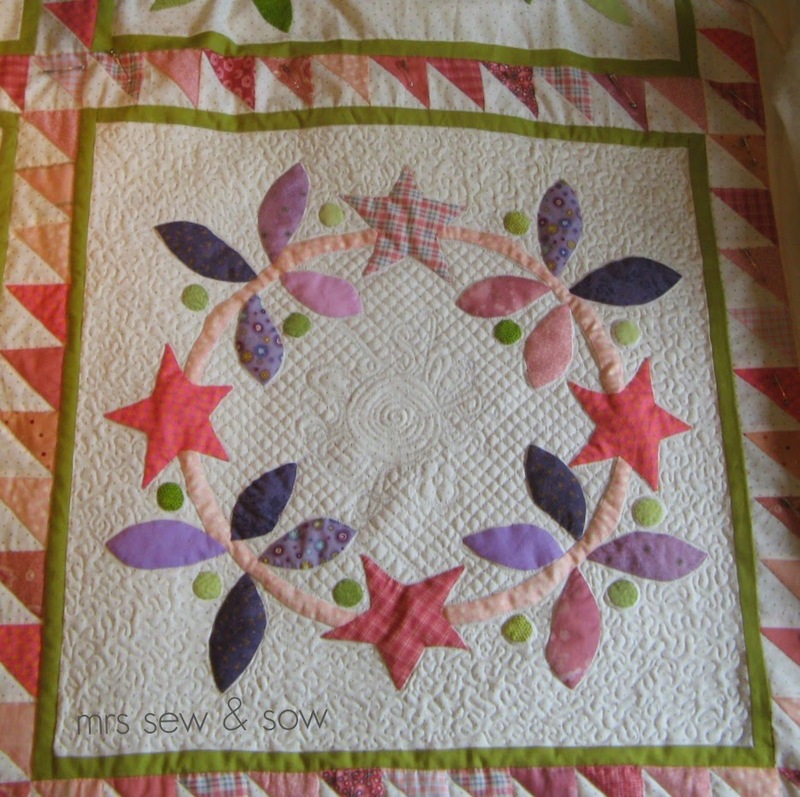 And the wreaths are crosshatched with my quilt label information in the centre! And now the pain of birth is over I am totally delighted with my baby! My bee mates in the fabulous Bee a Brit Stingy bee have been most excellent in helping me realise my vision of a Scandinavian red/white/aqua and teal Winter quilt. In fact their efforts have exceeded my expectations but I should have known better as they are a brilliant bunch! I have finished all four 8x8 panels of clamshells that I started out to make and have joined them all together by hand. It makes a 44" 'square' in all and now I'm wondering what next? 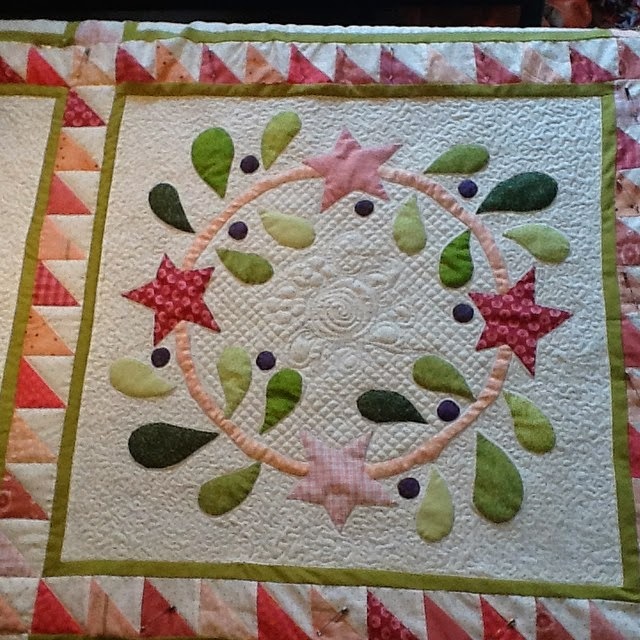 I was thinking I would have it on point and add triangles of clamshells to each side to finish up with a bigger square? But is this madness? That would be another 224 clamshells on top of the 256 already in there!? Oh well I wouldn't be surprised if I have that many charm squares to cut with my sizzix machine as I tend to cut charms from every fabric I buy and I've been in a few charm swaps too! The folk on IG seem to be saying yes! And now for something different...! The advantage of having lots of projects on the go is that you can change up what you are doing. So when I woke too early this morning I started cutting up some of my lovely blueberry park fabric printed by my friend and bee mate Karen. Step1 Mitre the parallelograms but only stitch up to the beginning of the seam allowance on the inside edge. Step 2 Stitch one side of the inside edge to your square (my squares are 5.75" 4.75" [edited the square size sorry for my mistake] - it works better with the parallelograms I cut using the sizzix die) all the way to your first corner - stopping a quarter inch from the end. If you are very clever you can lift your presser foot and line up the seams ready for the next seam but I just stop, cut my threads and re-position for the adjacent side lifting the corner out of the way. Now making the blocks like this means I will have to do more Y-seams when I'm stitching it all together but I don't mind! 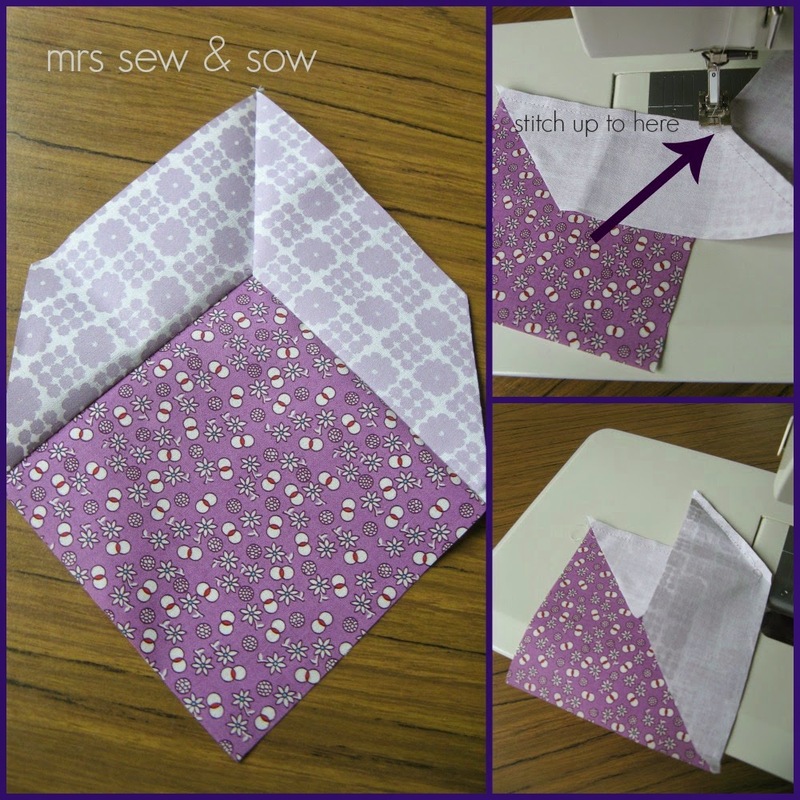 Y-seams and partial seams are great skills to have in your collection and they are easier than you think - honest! Do let me know if you make a version of this! 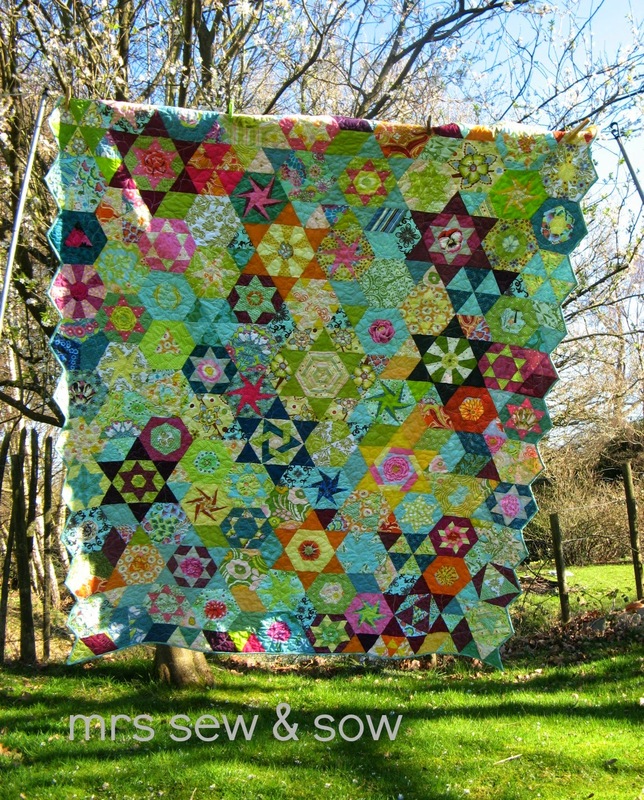 It is a great block to show off pretty fabrics I think. 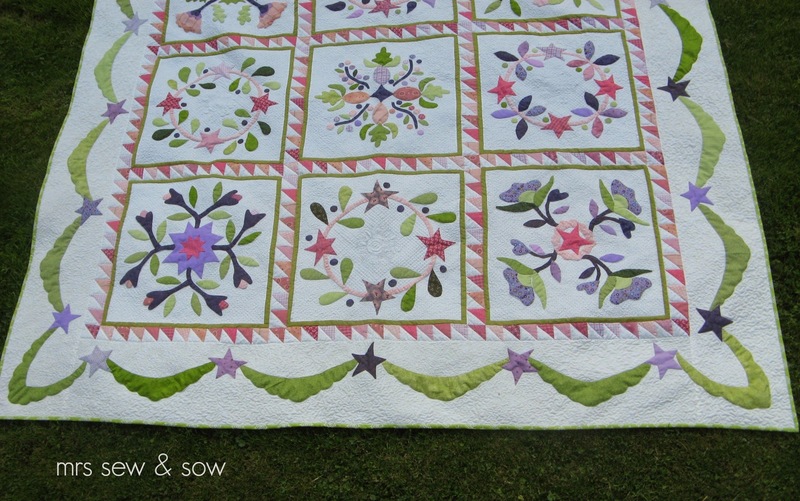 It seems I cannot stop working on this quilt now I've started - Friendship's Garden (pattern by Alma Allen and Cherie Ralston). 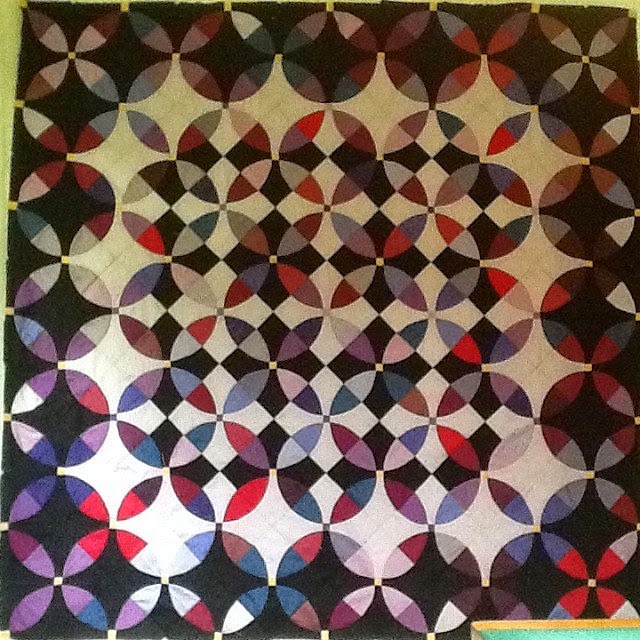 I don't tend to follow someone else's patterns now and indeed I changed the central block in this one to another by the same design team so that the quilt would work anyway up. Originally the central block was a basket design. Anyway here is block number three! 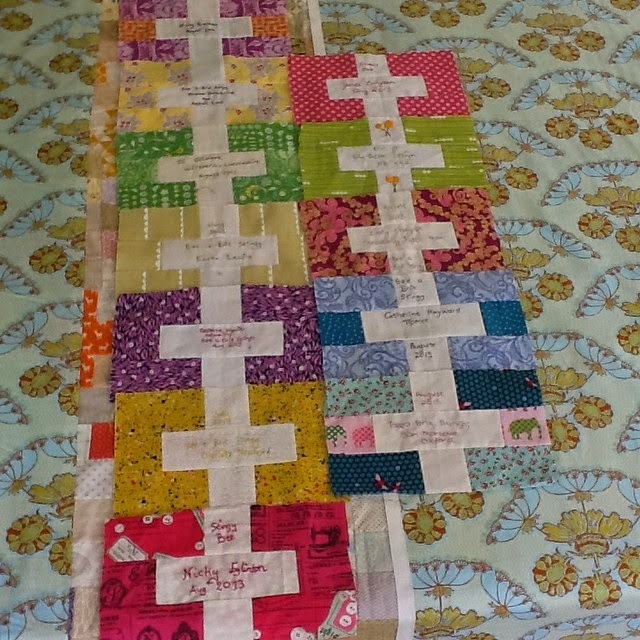 So one row is finished or will be when I've quilted the HST sashing to either side. 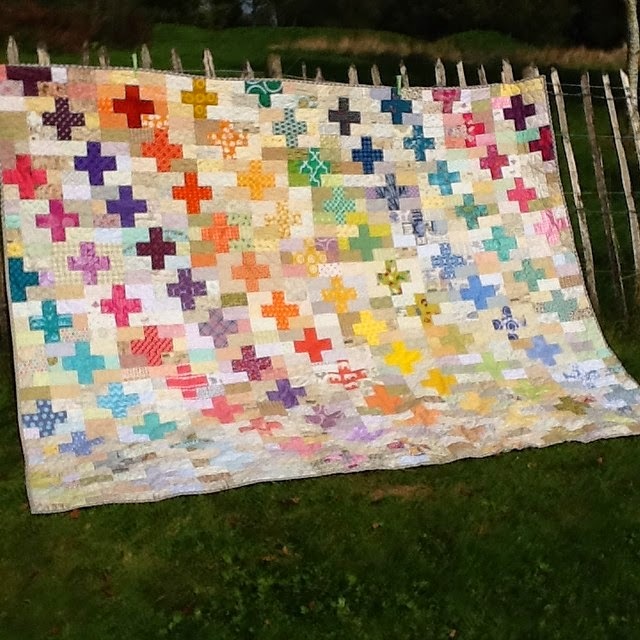 I am leaving the borders to the end and hoping they will quilt out nice and flat. My hands/brain are getting the mini stipple thing now and even the cross hatching seems easier to do. All more relaxed but still demanding quite intense concentration so breaks continue to be important between bouts of quilting. Eight strip of eight clamshells, waiting to be pieced together! 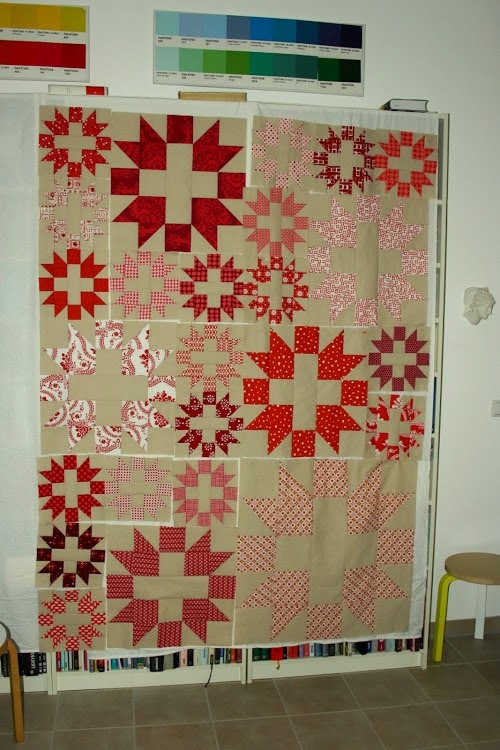 And then I can piece two panels together and then join all my panels together to make one big 16x16 clamshell square. Maybe then I can see were I'm going with this project. 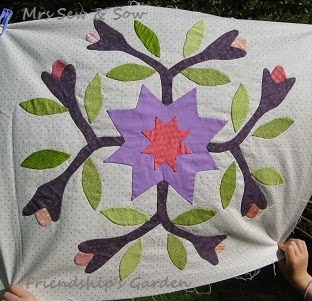 I planned to finish quilting one of my Friendship's Garden blocks every week. It is quite intense all that tiny stitching and not really something I've done before. 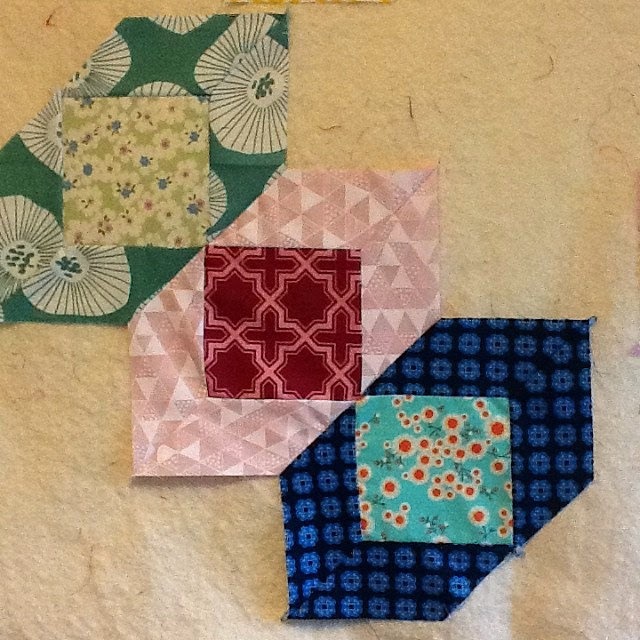 But yesterday I quilted one block and today I have quilted another....maybe I will manage to quilt one row per week. I have stippling outside the wreath, cross hatching inside plus the word Friendship's which will be joined by Garden in another wreath. 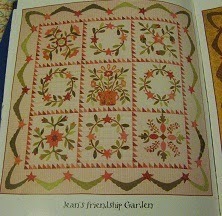 I have been calling this quilt Friendship's Garden (the pattern name) for so long I cannot think of it as anything else! 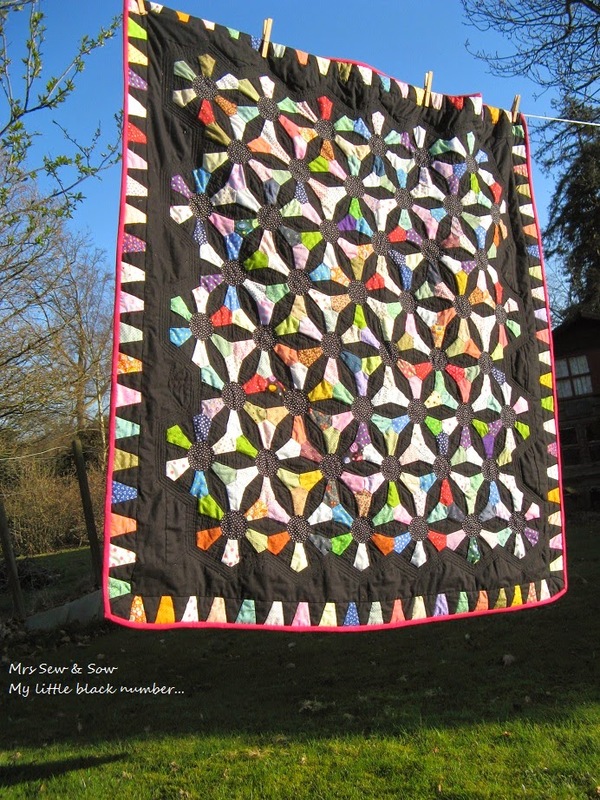 It is a Blackbird Designs' pattern by Alma Allen and Cherie Ralston. 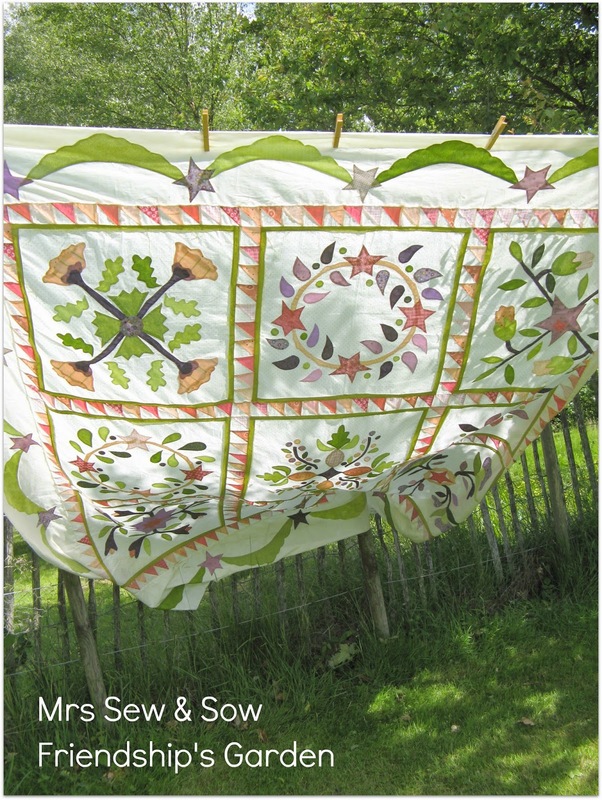 I really enjoyed the applique with the mix of straight lines and curves - it was a great pattern to learn from. 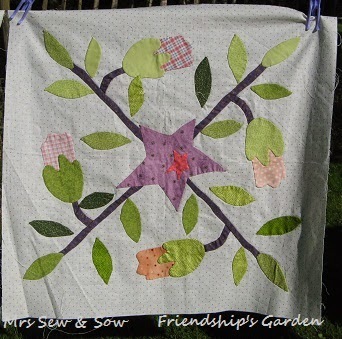 My Friendship's Garden has been with me since 2005 when I took a course using the Blackbird Designs pattern by Alma Allen and Cherie Ralston to learn appliqué. Over the months I did improve and I really love applique though do it less often. 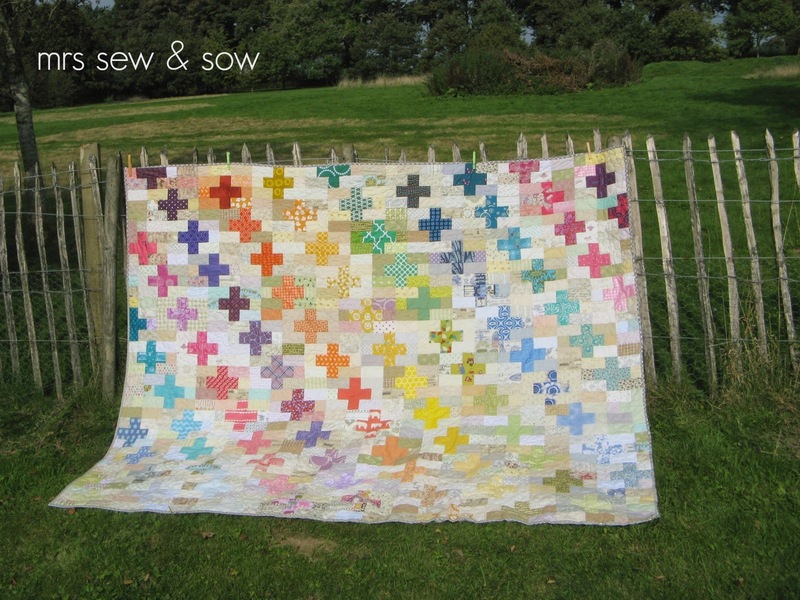 At that time the whole piecing thing scared me and a delay took hold while I looked on at the HST sashing in horror! 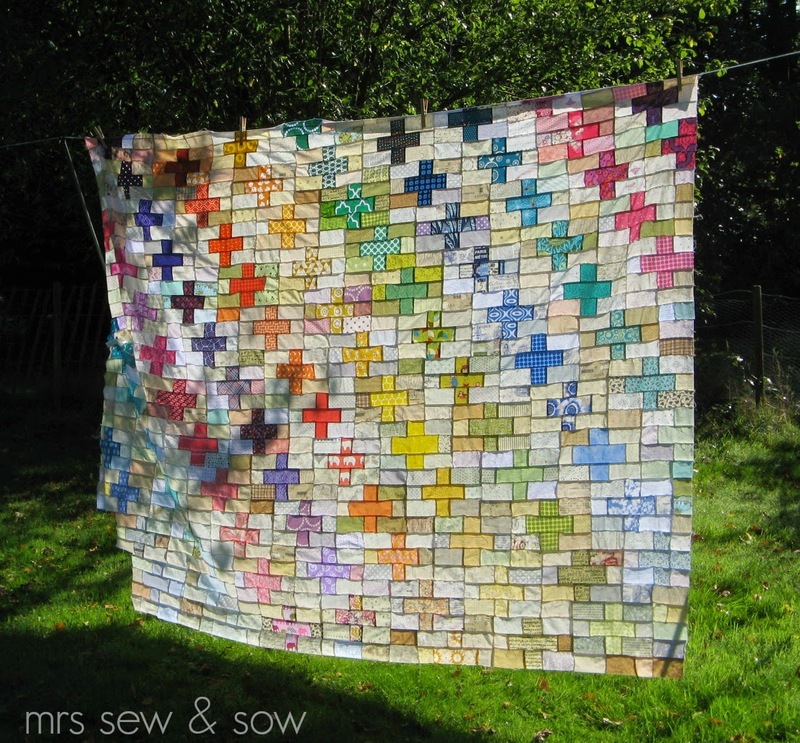 I did eventually get over that and love piecing now of course! 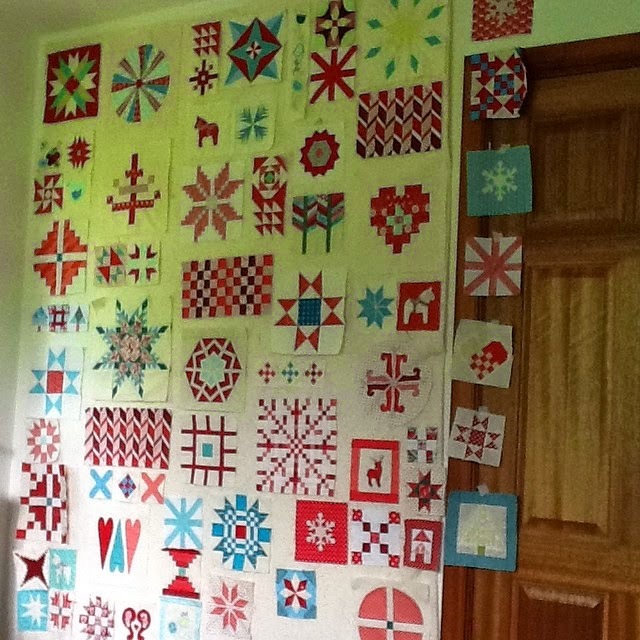 But once I got hooked on piecing the appliqué swag borders intimidated me! 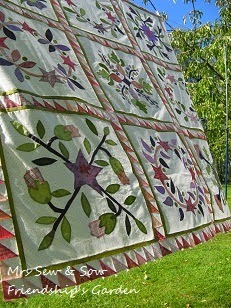 I am now happy with either skill but wasn't sure how to quilt this rather large quilt! Well FMQ has come to the rescue and I have bitten the bullet now with some small stippling (suggested by the ever helpful Helen). 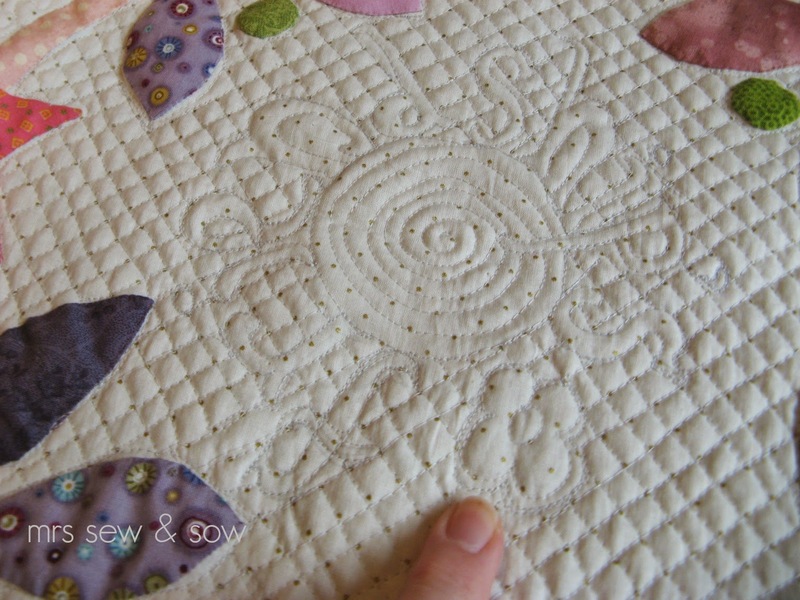 It really seems to puff up the applique - no doubt, helped by the wool wadding I used. I'm really rather pleased with it! ....but if I carry on in this vein I could be quilting for weeks to come! 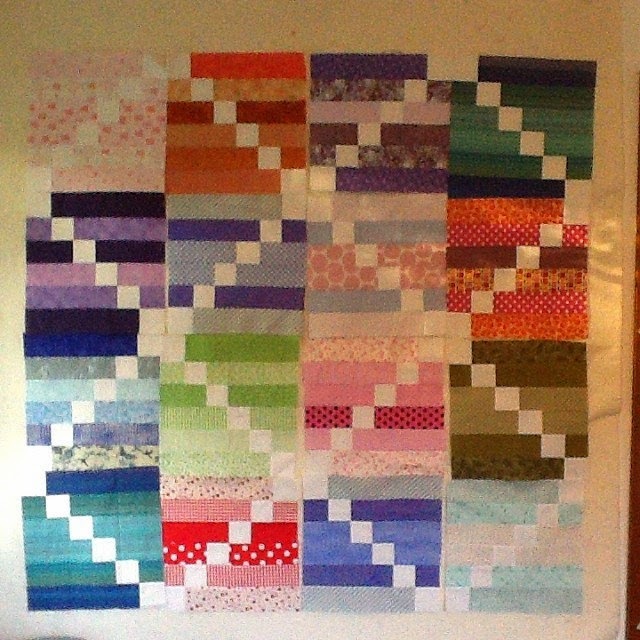 I have eight more blocks to come, HST sashing and some swag borders! I will definitely need lots of encouragement so get out your pom poms and cheer me on! Please! I know what you are thinking - here she goes again.......ok it's true I didn't mean to start so many. blocks and so I have a second one ready, and more blocks are coming to finish off a third I hope! Ayrshire Scottish ladies - not quite Argyll but close! 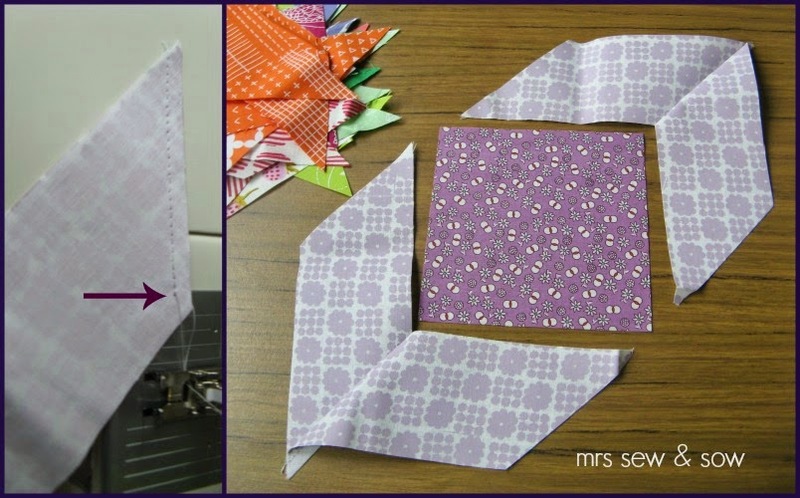 3 Clamshells quilt - I bought the Sizzix die and if you have the die, you have to use it right? ready to stitch. I am really enjoying stitching it all by hand - no really I am! able to resist finishing this top off! scraps so there will always have to be at least one scrap quilt on the go if I am to succeed! Wish me luck I'm calling that project Climbing Scrap Mountain - no exaggeration! 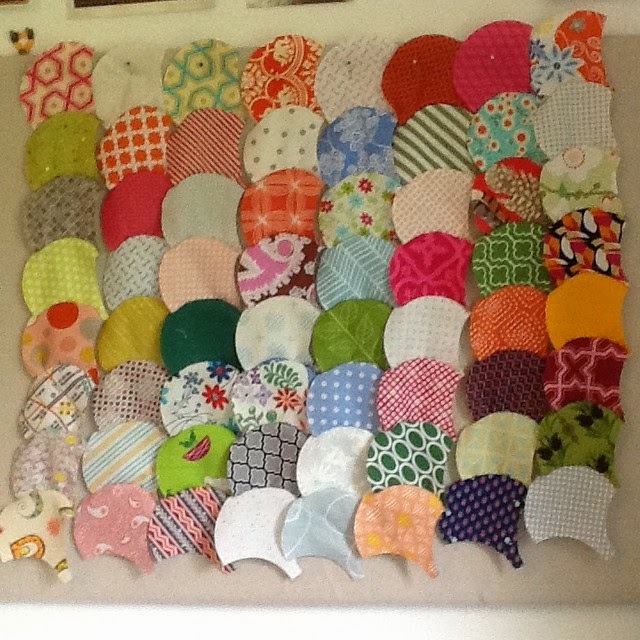 and have quite a collection now especially since I joined in her fabric club. 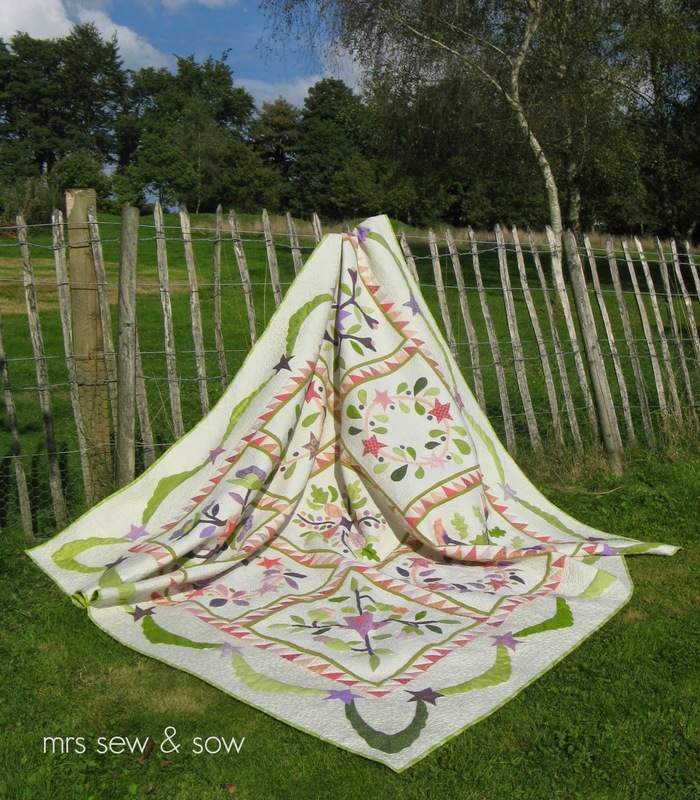 Just hope that if I can keep stitching I will get down to a sensibly sized list sometime!